Us, who collect, always want something. It's the nature of our hobby. Whether cards, stamps, coins, toys - you name it - there is something we don't possess in our hands. If you were to get everything you wanted, you stop collecting. That's true for us and certain sets. When you complete the set, you are no longer collecting it. We move on to other cards and sets to collect. Luckily, there is always something to want. A while back, I put together the White Sox teams sets for early Bowman and all Topps flagship sets. Before I started this blog, I was nowhere close to completing any. Hell - I didn't even know what I had in many of the years. So I took a couple days to put together the wants lists for those two brands. 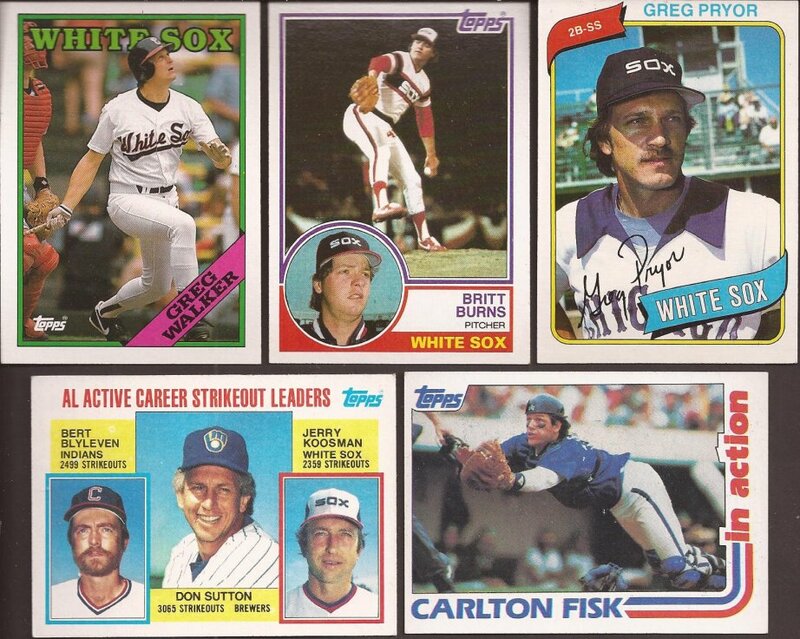 I will add the Upper Deck main set Sox needs in the near future. The best part of knowing exactly what you need is being able to focus on the hunt. That was my issue before I found the blogging community. I was a mess, all over the place. If you're a millionaire, you can have that willy nilly approach to sports cards. Even then, you cannot really appreciate what you have. But making lists, and staying focused moves you forward. A week or so ago, I was reading Mark's blog My Best Friend Collects Chipper Jones. He made a comment about getting close to completing the 2015 Topps set and had a list. While I don't have much, I have a few cards he needs. Mark replied with a simple email asking if I cared about the quality of the vintage cards I collect. Oh no - anything is happy with me. I learned that Mark cares about people out of the blue. I also learned that Mark has NO CLUE what lower quality looks like, cuz holy crap are the cards he sent me immaculate. I still have my side of cards to sent out, but let me show you what Mark found on my want lists. We'll start with the most recent and go back in time. Let's start in the 80's. 34 total cards were from the 80's. When I built my team lists, I forgot how few of 1983 I had until 16 cards came out of Mark's envelope. Great night shot of Britt Burns (Owl?). Even better is that In Action of Pudge. One of those many cards I didn't have and never realized how nice the hockey set looks. Into the 70's Mark sent over 7 needs. I got me some Wood (twice!). Good view of old Yankee Stadium in the background of that Pryor card. Lastly, does Hrabosky ever smile? Did they have cameras in the mid 70's that could zoom in that close, cuz that sure looks like a picture just before he delivered a ball to the plate. Mark kept going back farther. From the 60's he dropped 8 glorious pieces of cardboard. Here is 5 of them. I'm not sure the ballpark behind Esposito. It may be Tiger Stadium. Horlen is in the Bromx. 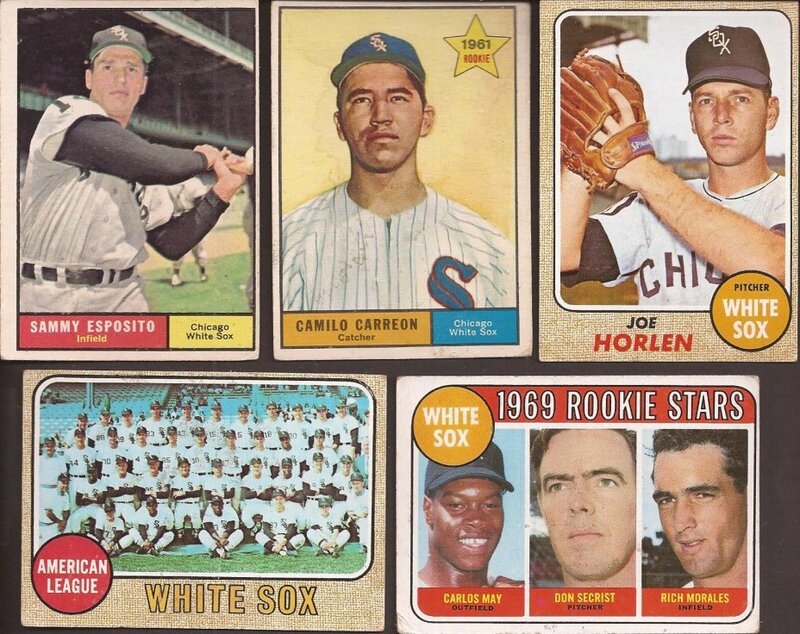 Carreon didn't have the huge career that was expected, but I have wanted to add his rookie to my Sox binder. Here's the last of the 60's (literally, 1960) and a couple sweet '59s. 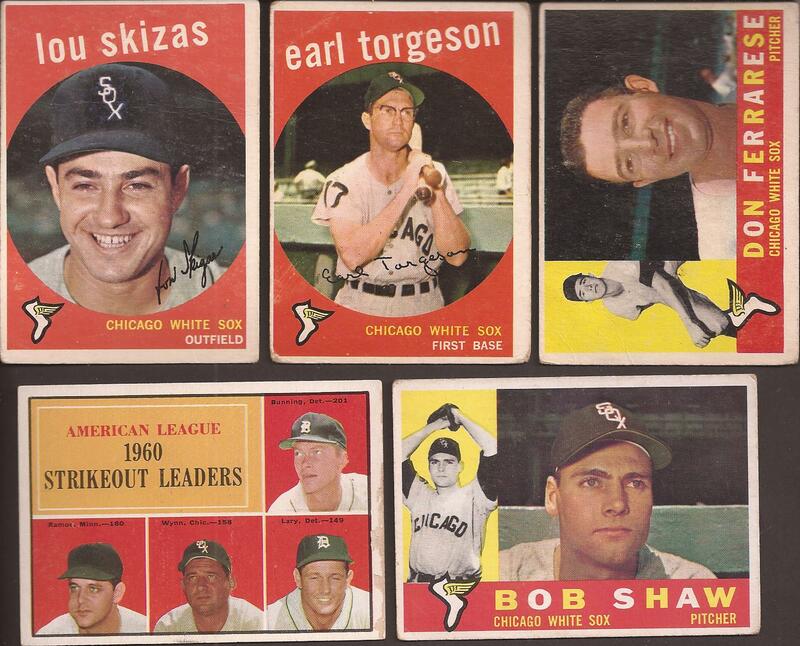 Of the total 51 cards, that Torgeson is the "worst" of the lot with that crease in the upper left. And that is what Mark considered "lower quality". Mark - these are amazing cards, and I cannot thank you enough for thinking of sending me such amazing vintage in return for a half dozen 2015 Topps. Your envelope got a little fatter. Man, there's something mesmerizing about that Camilo Carreon RC. Very nice package. The In Action Fisk is one of my favorites of his, just a great shot. I'm not sure I've seen that 1976 Leading Firemen card before and I don't know why not. Can't listen to that song without thinking of Super Size Me. Damn... I'm craving some McDonald's fries right now. Thank you for writing such a great post. 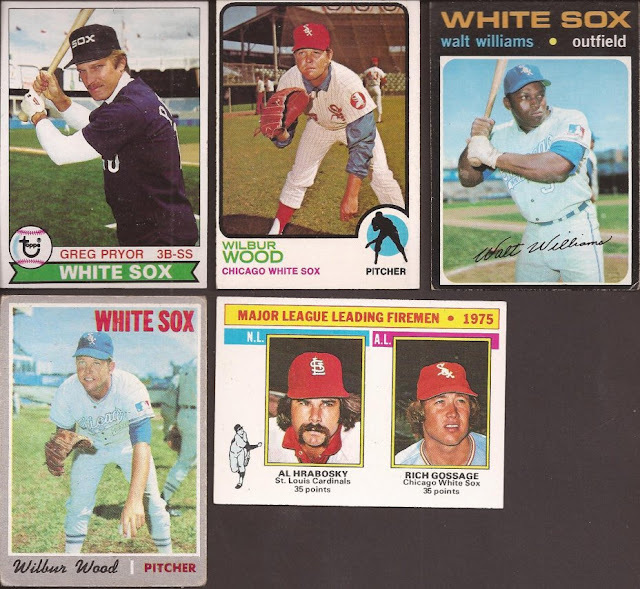 I am happy to help you work on your White Sox team sets. I am new at this trading stuff and just wanted to include cards that you might like. And your are right that Hrabosky never smiled. I remember watching when he pitched for the Cardinals in the mid 70s. He was very intimidating with his fu mancha mustache.